Wild Wednesday – Name That Mammal! It all started when Hub began teaching me about music, and musicians. You see when we first met, I was pretty musically stupid; although I liked music I had never paid much attention to the names of the bands, or the songs, that I liked. Any of you out there who are musicians are sure to sympathize with Hub. Awesome song comes on the radio while we’re driving. Me: Oh, I love this song! Cue off-tempo tapping on my leg. Hub: Oh yeah? Who’s singing it? Then, with rolled eyes. And you’re off. Hub then demonstrates the ‘proper’ way to tap in time with the beat. Me: What do you mean I’m on the one and the three? That matters? And I don’t know who this is. Or the name of the song. See, I know that’s going to be Hub’s next question. Thus began my musical education. Now I can tell Led Zepplin from Rush, name which Beatle is singing which song, name the artist AND title of my favorite songs, and I have finally (somewhat) mastered the fine art of keeping time ‘appropriately.’ Who knew counting to four could be so difficult? But, why should Hub have all the teaching fun with Name That Tune? So I started Name That Mammal. He’s getting pretty good, too. What’s that? You say you can’t wait to learn fun facts about some cool creatures? This cat is usually spotted, but has tell-tale tear marks that positively identify it. The spots on this cat are solid, and irregularly shaped. Again you see the distinctive tear marks. These act like the dark marks football players will put under their eyes; they help reduce the glare of the bright African sun. 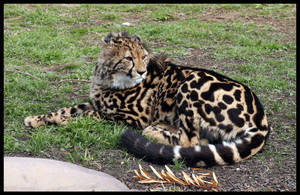 At one time, you could find these cats throughout southern Asia, India, and Africa. Today they have lost more than 3/4 of their former range. Their extraordinarily flexible spine allows them an incredible reach and drive when they run, making them the fastest land mammal, able to reach speeds of up to 70 mph. I worked with Kubali for a brief time before I left the Zoo. She was the last big cat I worked with but she is still there today meeting and educating Zoo visitors. Like their tiny cousins, these cats purr. They are the only big cat to do so. She was purring when this picture was taken. Bonus points if you can name the coat type in Picture 1. To give credit where credit is due. Pictures 1, 2 and 3 were found at the following websites. Picture 4 is all mine! Next postWeird Weekend – Reiki, Is It For Real? I tried but I’m probably wrong! What a glorious creature! The sleek lines and aerodynamic body are just amazing ~ 70 mph? Wow. That’s one fast cat! I love the pic of you and Kubali, so sweet. They are pretty incredible creatures. It was a real privilege to be able to work with Kubali. I strolled over here from Susie’s party and love the photos, especially the last one. What a great experience! Hi Emily, welcome! Thanks for reading. I know I’ve said this before, but that must have been the coolest job in the world! I love seeing your pictures of you and the animals. Keep them coming for my enjoyment. How cool! Another zoo person! Thanks for stopping by. My first zoo job was as a volunteer at the Santa Ana Zoo, and I spent many happy hours in a zoomobile. Welcome! I would have guessed jaguar, Serena, but I happened to mouse over the pictures, and the ID came up for each one. Love that photo of you and Kubali. Amazing animal! It’s so cool to see how their physical makeup works in action–ie that flexible spine and the speeds they can reach. They’re definitely short distance sprinters, but for that short space of time, WOW! At the San Diego Wild Animal Park they do (or did) running demos for the public with their cheetahs. Beautiful. I am sure it wasn’t all petting the big cats all day, but boy am I envious of your time with the zoo. That’s so great that you worked with such an amazing animal! Wow! Love it! I guessed right 🙂 Such beautiful pictures. I envy you for having the chance to interact with these wild animals in real life. That’s always been a dream of mine. I have a whole list of wild animals I’d love to meet, pet, and learn more about. Yep, the Circle of Life. 🙂 It works out beautifully.